Celebrities hunt for antiques across the UK. Award-winning journalists John Stapleton and Lynn Faulds Wood head to Stockport for auction. Browse content similar to John Stapleton and Lynn Faulds Wood. Check below for episodes and series from the same categories and more! -I'll do that in slo-mo. 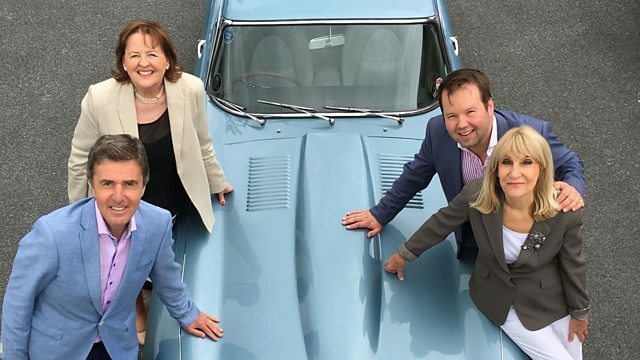 Put your pedal to the metal - this is the Celebrity Antiques Road Trip. who are a celebrity couple. John Stapleton and Lynn Faulds Wood. News Presenter Of The Year. and this is the BBC's Breakfast Time programme. and was named Consumer Journalist Of The Decade in the '80s. within easy reach of the checkout? Make-up, for example? Or tights? This could be the end of the long and glorious marriage. They don't come as cheap as me, you know. in this saucy little red 1971 TVR Vixen. on British television. We predated Richard and Judy. how long is it since we stopped doing Watchdog? By Jove, you're both ageing well. Thomas Plant and Margie Cooper. in this beautiful blue Series One Jaguar E-Type, made in 1964.
which is why they're not wearing any. I've never driven a Jaguar E-Type in my life. What an amazing, what an iconic car. I'm sort of trying to get to grips with it. -Well, I can't keep my eyes off you. with £400 in their pockets. Where are they? We've been, what? Five minutes, ten minutes? so I'm having this one. -Oh, it's not a Reliant Robin. I'd like Thomas, please, if you don't mind. Now, this is a bit more like it. That is a colour I can live with. Thank you very much indeed. Sky blue, Manchester City blue. Perfect! And look who's there! -We were destined to be together. -And I'm so glad I've got you. -Do you know a lot? -Well, we will be your helpers. So, are you two competitive? Let me tell you, she is the most competitive person you will ever meet. I reckon John's quite competitive. -We're going to sort that out. Well, let's find out, but I hope he loses. -Are you going to drive? -I'll drive. Can I drive? Paired off, it's time to hit the road. And opportunity to get to know one another. So, have you ever driven a classic car before? Does my car count as classic? Well, it was made in, like, 2005 or something, isn't it? It's a beautiful car, this. But not the easiest in the world to drive. If you see smoke, give me a shout, will you? in Lancashire, where they will both kick off their shopping. That was very nice of you to say this. ..you would be probably masters at negotiation. No, no, come on. Give yourself some credit there. You've got to be masters. Hang on, I've just mastered this car. You've got to be masters at negotiation. What we call... I was born in Glasgow, we call it nuttings. -and I used to go and doorstep them. So I'm good at that sort of stuff. Er, it's not really, Thomas. before I got a job as a journalist, aged 17, yeah. So you showed persistence and that is the answer. That's one of the key things, persistence. So you met Lynn on a television programme? No, I met Lynn in a pub. -She was pulling pints in a pub in Richmond. -supplementing her income as a barmaid. And I used to pop into this pub with my mate. she used to slip us lumps of cheese to make an omelette. So she wasn't in journalism then? because I bought her a nightie that didn't fit. Right? -they refused to give her her money back or something like that. -Good gracious, what a story. All over a nightie, yeah. Lynn and Thomas have arrived at the first shop. You're now entering my territory. -And we're ahead of John. -I know, which is good, isn't it? It's always good to be the first ones in. from vintage crockery to fine antiques. -Can we come in and get some great deals from you? -They've beaten us to it. if you had a car that was easy to get out of. -Come on, let's see what we've got. Where is the best place to find your best bargains? Come on, come on, get out the way! -We'll go upstairs, we'll go upstairs. -They beat us to it. I'm John. -Thanks for looking after us. I hope you enjoy it. Have a good wander around. -Are they going to get all the best deals now they're here first? Friendly banter aside, time to get down to business. So what sort of thing am I looking for? I think something decorative. If it catches your eye, it's going to be good. -You said... get something quirky. It doesn't get much quirkier than this, does it? -on The Antiques Road Trip. Step away from the cuddly toy, John. You know, I was saying maybe I'd like something Scottish? And this makes me think of bagpipes. Well, it's a push box. -Yeah, but do these sell? -You can tell I'm musical. -So you're missing the straps. Here's the maker here, CGH. They're normally made on the Continent. -But you are missing quite a bit of material. -You're missing a button there. I mean, some of these boxes can make hundreds of pounds. -Well, I don't know enough about them, to be candid. -60 quid doesn't seem like a great deal of money. -If something like 20 quid, 25 quid? Yeah, but it's marked at 60. I love your optimism here! -I love your optimism, it's great. -I think you haven't got a cat in hell's chance of getting it. You're not a fool, but it's worth having a go. -Just checking on you lot. -You're not allowed to look. -how are you doing? We're doing brilliantly down there. -Have you bought, have you bought? -No rush, no rush, bye. No, there is a rush. Bye! Glasgow Kiss, as they call it! but she is making a cheeky bid on the £60 German squeeze-box. there's some of the fretwork missing, there's one little knobby thing that's missing. -Tell me what silly money you're thinking of? -Go on! I haven't bought anything yet today. I can do 25, but I couldn't do 20. I have to consult my colleague. You've done... I couldn't believe you. My husband says I'm the most competitive person he's ever met. so you're my first haggle. I love you, Lynn, thank you very much, 25 quid. Ha, the consumer champion is a champion consumer. A fabulous first deal there for just £25. -Are we going to play a happy tune to the auction? -Yeah, what can you play? I can't play very much. Best stick to the day job, Thomas. Back inside, though, Margie's onto something. It's a... That's Noritake, which is Japanese. They're always nice quality, Noritake vases. You've always got nice gilding, pretty hand-painted flowers. there's a pair, but I can't see it. so I'm only showing you because I just thought you might like it. -I do, I think it's lovely. Yeah, it is lovely, but where's the other one? -Oh, that's, it's 100 years old. Yeah, late Victorian, early 19th century. which would cost £180 if it was a pair. so we'd possibly like to buy this on its own, right? As it's you, we'd let it go for 60, but that would be the very best. Can it come down another ten, could you do 50 on it? Not really, no, I can't. What about 55, meet us halfway? -Thank you very much indeed, Lynn, thank you. £55 buys John and Margie their first lot for auction. Don't get my pot wet. I'm going to link your arm. Lynn and Thomas have hit the road and made their way to Liverpool. It was the first school of its kind in the world. to find out more about the illnesses the 19th century sailors faced. causing the greatest amount of damage, causing deaths and disability. Did we call it malaria at that time? Did we know that's what it was? what parasites were causing the disease. That really only came in the late, the very late 19th century. -That must have been a Eureka moment. because it was these little things here, critters. -Ronald Ross sounds like an amazing man. He was, in many ways, one of the first tropical physicians. And in 1902, he got the Nobel Prize for that discovery. Wow! I'm really interested in promoting women's part in any of this. Were there women involved in setting up the school? at a time when women didn't travel around Africa. way that LSTM does work in the tropics. Liverpool School of Tropical Medicine did its work. in Africa, rather than imposing in a very colonial way. That's a philosophy that we espouse to this day. finding solutions together with these populations that are suffering from diseases. where diseases, animals bite people and things go wrong? Yes, many of our researchers travel all the time. Probably in slightly more luxury than Mary Kingsley did. -But we go out there and we investigate and we treat these diseases. antimalarial medicines and has a unique resource for snake venom research. milked for their venom by herpetologist Paul and senior lecturer Nick. which is a snake you find all over Africa. They're enormous snakes, as you can see, and have got a very potent venom. to make sure that it's safe. You can see there that Paul is holding the head of the snake there. That's quite dangerous for Paul, is it? This is all experience, so really experienced people can do it well. -clingfilm there, and you can see the venom milks down. for use in making antivenom, which is the treatment for a snake bite. is key to the school's research into antivenom. -Oh! He means it, he means it! -They're pretty nasty snakes, though. -Look at all that coming out. You can see the power there as well. if you didn't know what you were doing. treatments, by investigating what the components of that venom are. John and Margie have made their way to Bretherton and their next shop. It gets deeper and deeper down there. It does. Quick, quick, quick! and John and Margie still have £345 in their pocket. You tend to not look up, I always look down. Look up, because you see all sorts of things hanging about. -It's good for your double chin as well. Certainly better profile, darling, yeah, much better. I'll remember that. That's Tunbridge ware, that box. They're called tesserae, yeah, little, tiny squares of all different woods. -And it was souvenir ware. We'll have a look at that, if we can remember. so one to ask Aidan about later. Now, it looks like something shiny has caught John's eye. Got a bit of silverware here. You know me and a bit of silverware. Yes. What's that, just an ornamental bowl? -It's a little bonbon dish. But it's nice. I'll tell you why it's nice, it's on little splay feet. -Which makes it really pretty. And a snip at 125 quid? Well, I think that's negotiable. So that and that little snuffbox, potentially. -That's two to think about. Potential purchases are stacking up. Gosh, these look nice. Look at that, gosh. -Off a carriage. A horse and carriage. Wow. Do you know many people who have got a horse and carriage? because there's one behind you. So we've got a pair. -But they're going to be dear. Georgian. Early 19th century, 1820. So get those, all I need now is a horse and carriage! With three possible lots, are there deals to be had with Aidan? First up, the Victorian silver bonbon dish. You've got 125 on the ticket here. Well, we're pushed, aren't we? Because we've got some other things in mind. -We've got plans for you, Aidan. -Have you got plans for me? -The gallows are at the back! We're looking for a very good deal in here. -I want you to do well. -You're a good man. Thank you very much indeed. That's the silver bonbon dish bagged for less than half price. Time for the turn of the Tunbridge ware snuffbox. It wants a good clean. It does, and there's a bit of damage there. -Why, because of the mark? Look, come on, it's 20 quid, isn't it? we would happily give you £30 if it wasn't for a great, thundering chip. -Do you want that for 20 quid? -You can't lose, you've got two pieces, top and bottom. -Will you clean it as well? -I'll give it a clean. AND with a clean-up thrown in for free. Right, John and Margie still have £265. Can they strike a deal on the rare Georgian coach lamps? -I didn't think they were. Go on. -You're looking at five or 600 quid. -Are you in for a deal or not? I'm always in for a deal. It's a huge purchase for us, isn't it? All your budget, all your budget! -No, we haven't got that. -So, 200 would be out of the question? -I think they could fly. -But it is a gamble. It's a big outlay, but let's do it. That's what we use every day, isn't it, darling? -Shall we do it three ways? but that's the rare coach lamps secured for £225. of shopping for our two teams. I bid you all nighty-night. Lynn and John are reunited and swapping stories about their experts. kindred spirit, Northern lass, bound to work, wasn't it? -And a Man City fan, what more could you ask for, really? I'm surprised I didn't marry her, really. I know nothing about antiques. I keep saying "I love it". And he really does know things. He's very... Again, he's very reassuring. I'd like to take him home, would that be all right? By all means, darling, by all means, if you can afford him. I think she probably could! which means she still has a huge purse of £375. While big spenders John and Margie have bagged an impressive four lots. leaving them with a mere £40 to spend today. How did it go with John yesterday? Great. We had a lovely day. And you know something? I don't know whether I should tell you. I've only got £40 left. So we'll see what £40 brings today. You've got a real sense of, you know, devil-may-care about you. I have. And how was your day? out there and you've done it, Margie. I have, I have, four items purchased. -to sleep if I don't. -Do you think I'm a hard nut? I think you've got your moments, yes, darling. We have been married a long time. I wonder if it will last this Antiques Road Trip. Gosh, I do hope so. -I know we are, look. -but... Not as hard. How are you? -We've got to get our game on. Margie knows. Margie knows. They've bought four things. -We're in a hurry, then! -We are in a hurry. -Yay! On the road again. north-east corner of the Wirral. I ended up doing a lot of safety stuff because people wrote to me. "then, when they get to hospital, we can save their lives?" "Why don't you put a hole on the end of the pen?" Because I had by then about 12 deaths. said, "Yes, we can do that." Bic said, "We couldn't possibly do that because the ink might dry out." iconic pen top. Thank you very much, Bic, for putting that hole in. This pair are armed with £375 to spend at their first shop of the day. -One gets quite hot in the car, don't you? -Good morning. Nice to meet you, Lynn. I'm Sean, welcome to New Brighton. have at very nice prices? We have stuff. We have piles and piles of stuff. Sean's stock's piled high, especially downstairs. Lordy, look at that lot. Wow, can we get in here? Sean, you have got some stuff. Yeah, we have people who come down here and I forget they're down there. People rummaging. I'll leave you to it, guys. Give me a shout if you need anything. Lynn, we've got our work cut out. This is going to be a bit of fun. I'm not sure Lynn is convinced about fun. Good luck wading through this lot, though. Look, there's a three-legged Clydesdale. Oh, look, they obviously collect them, there's a two-legged one. Is that a two-legged one? John and Margie are still on the road. -You must have interviewed a lot of those. So... In one form or... Some of them several times, actually. and was a challenge, to put it mildly. before the actual interview. Not in the least interested. -And I found her quite intimidating, actually. Well, thankfully, Margie is no Iron Lady, so you can relax. Lynn's knee-deep in antiques and collectables. -I just saw a box that I thought was quite interesting. -Where did you see that? -It's over there, but it won't be worth much. Because there's some tins up there. You could do a job lot of tins. So this is an early 1900, 1920s tin. Look at the lovely graphics on there. Um... It's not floating my boat. It's not, is it? No. Hmm. Lynn may need a bit more convincing, Thomas. A job lot of tins isn't what she had in mind. I'm loving this, are you loving this? I've found some Scottie dogs, I'm beginning to love it a bit more. But I'm not going to beat John with tins, am I? We'd better put the better ones on top. nick. Don't they have to be in better nick to sell? -for hundreds and hundreds of pounds. -Have you sold tins like these? But I think we try and buy them for very, very little. How dirty are you? Look at your hands. Thank you. Next time I come into your world, I shan't wear white trousers. Look, and I know I'm entering my world and I'm wearing white trousers! Right, are you going to offer a pound? -I'm going to offer £1. There's no messing with Lynn Faulds Wood. -Lynn and I have been busy. -You've been down there about an hour. I think we've done you a service. Yeah, perhaps you could pay us to take it. I'm feeling a bit guilty, that I should be paying you to take it away. In that case, could we take that for £1? Well, I'm a businessman, so I think I need more than £1. Oh, no, that's... You see, because I'm not sure I can make a profit on that. Well, make it two quid. Sean, you're a wonderful man, I'll do two quid. selection of Victorian and Edwardian tins for just £2. Now, how to fit them in the tight TVR? -Will you stand here and look decorative? Would you like me to buy something smaller? -That tea caddy looks a bit knackered. Is that a technical term? My favourite one's that red one. For two quid. Right, there you are, we're done. And we don't keep that to carry them. Sell it back to him. A quid for his crate. A quid for his crate? Right, I'll be back. John and Margie, meanwhile, have made their way to Birkenhead. And are arriving at the Wirral Transport Museum. Wow, look at this lot. My goodness me. Oh, we've got the light on here. the mid-19th century by introducing the American streetcar. John and Margie are meeting tram expert Rob Jones to find out more. Streetcars at that stage were pulled by horses. -What was the reception when he came here initially? Well, he was helping run his uncle's shipping line in Liverpool. "New Orleans and New York and Boston and Philadelphia. a big employer in the town. John Laird said, "Well, we'll give you a try. "if it's a failure, you must take it away at your own expense." "I've got an inroad here." And he made a success of it. And what was its advantage over the horse-drawn tram? and it went twice the speed of horse trams. the tram, picking up the... You know what, the manure. But everybody else was taken on. You say it was such a success here in Birkenhead. Did other cities and towns follow suit? Yes, it gradually got more enthusiasm. and cities in our country that had trams. What caused the decline of the tram? After the First World War, trams were in decline because of motor buses. The technology was growing at a fantastic rate and motor buses came in. Actually, I used the B word here. We don't... We're a tram place here, so we talk about the B word. Rob is kindly letting John take a turn in driving a tram. Hello, Dave, pleased to meet you. Dave's going to look after you, make sure you do everything spot on. Now then, obviously, I don't want to crash this. Well, the first thing you need is the key. -So this actually goes in there. Let me do that for you. That's great. Oh, yes. Hey, I rather like this. -We're actually doing some speed. Hey, it's quite fast, isn't it? It is, yeah. It soon picks up. It's quite a speed this, actually. I'm really quite impressed. -Bring the control back to off. To slow it down again. took the plunge and secured Britain's first tram system. All thanks to George Francis Train. It would have been so much easier if he'd called himself Tram. ..still armed with a whopping £373. They've got some serious money to spend. -Good to meet you, Lynn. Hello, Thomas. Good to meet you. We're really interested... You've got lovely stuff. -We'll see what we can do. We need to make a living. Well, you see, I have to beat my husband, John Stapleton. With winning on their minds, Lynn and Thomas get stuck in. And it doesn't take long for our Tom to dig up something. I've never seen a wooden spade before. It's a cool thing. I love the size of it. -I love it, too, but I have got a lot of money. I have got very little money to spend if I'm going to thrash my husband. which is ticketed at £36. And Lynn has spotted something in the shop window. -The gold pendant at the back? -Well, it's probably not deco. -No, it's going to be earlier than that. -And what's the little green stone? -I've never heard of that. We call it an olivine. It's a paradise stone. It's got a great sort of lovely green to it. But that is extremely wearable. I told you I knew nothing. I've never heard of peridot. But you've got an eye, you've got an eye, haven't you? so another it's for consideration. Would pictures sell at this auction? What... I mean, do you like her? She's lovely, but I prefer the fat baby. -I hadn't seen the fat baby. Look at the fat baby. What's a fat baby doing there? Oil on canvas. Hercules And The Serpents. the oil painting is added to the list of other potential purchases. Now, what's that? Is that an ashtray? The silver dish. Antique silver dish. -And what are those animals round it, horses and...? the white metal Sri Lankan dish is also set aside for negotiation. That pendant is still playing on Lynn's mind. So you've got the Art Nouveau design. The chain is not associated, it's sold with it. I'm just going to turn it over. So we've got the lovely design here. Peridot. It's actually a good-looking thing, isn't it? Right. So, we like that, we like that. And Lynn's not done yet. I really like the fat baby. Turn it over and show the back to me. So what you've got here is the modern frame, which is fine. So if I just peel this off. There we are, look. So if we do that there, there's a bit of writing on there. We can't see what it is. This is 1900 board. -want to do a deal on that. -You can see the infant Hercules. but Thomas has one more he'd like to add. This is what you are so attracted to. Well, I've never seen anything like it. Lynn is not convinced on that spade. which have a combined ticket price of over £400. I have to say, that's an immensely fair reduction. Would you come any lower than that, because I feel I should haggle? -Are you going to do it? Yes. You're a lovely man. And a very generous discount. the painting for 60, the white metal dish for 50, and the spade for 15. We've done it, but I don't know whether we're going to beat John. Come on, we've got the tins! this vibrant market town is home to John and Margie's final shop. Last call of the day. Come on. In we go. John and Margie have just £40 left to spend. Oh, that's branny, that is, as they say in the trade. -A branny? What does that mean? -Yeah. That's just trying to be something it isn't. -No. That's not for us. But well spotted. Yeah, that's quite nice, isn't it? I could see my roast beef on that. -Yeah, it's all right, isn't it? what we assume that it's like in the Orient. That is willow pattern, isn't it? It is all transfer printed. -You can see the join there, can you see? -Do you see that little bit there? So what, they print the whole thing on? -It's actually quite nice, that. Dealer Jill is on hand to help get a closer look. Let's get a mark, yeah. Japanese... Anything to do with Japanese. The Mikado was inspired by the Japanese interest. And this stuff was just so immensely popular. And still looks fabulous today. I mean, it's a lovely, attractive plate. -Yeah, we like that, don't we? -Do you know much about it, Jill? I don't. It's another dealer's stock. Oh. We haven't actually got much money left. -We've come to you with very little. for us, given that we genuinely don't have much money? -Yeah, certainly. I'll give him a call for you. but how low will the dealer go? -Could do it for 22. -He'll do it for 22. -Well, that would be nice, wouldn't it? -I think that's all right. -That's very kind. Thank you very much. And with that generous discount, John and Margie are all bought up. Right, shopping done and dusted, time for a spot of show and tell. It'll be something delicate. Good heavens! I thought you were supposed to get four or five things? You look as though you've bought an entire grocery shop. How much do you think we paid for this lot here? Well, I haven't the faintest idea. -There's got to be a little bit of a profit there. -There'll be some mark-up on that. There's some good boxes in here. -This could be a runaway hit. There are some great tins in this. Yes, they're in lovely, original condition. Also known as a bit battered. You have quantity. May I suggest here we have quality, right? I've never seen cylindrical ones. Margie, you would have paid a fair bit of money for those. We have paid. And what are your thoughts about that? Well, it's from Japan and it will have a hand-painted scene on it. -I like those coaching lamps. Yes, I like those coaching lamps. Those items you've got before all of that are all going to make a profit. -Yes. The coaching lamps could let you down. the hands of my expert, in whom I have absolute faith, I love it. -I think we'll go off and have a cup of tea. Out of earshot, what do they really make of each other's lots? Well, I tell you what, I saw those tins. That's just a load of old tat, isn't it? -so they'll make money out of that, I think. -I think they could win. -You see, I like those coach lamps. They're the kind of thing that people buy to do up houses differently. OK, I bow to your superior knowledge. How are you rating your chances today? Well, I'm meant to say I think we'll win, but I have my doubts. I've never seen you even with a scintilla of doubt about anything you've ever done. -I'm just loving the game. -Well, this is a first. our experts have arrived at Maxwells auctioneers under their own steam. -Are you going to slip out of that? -Our tins are going to win it. -Our tins are going to win the day. Right, let's go in. Come on. Well, we'll soon find out. On this tremendous trip, Lynn and Thomas spent £292 on six auction lots. almost blowing their entire budget, spending £382. Bravo. The man with the gavel today is Max Blackmore. Some quite unusual items, like the concertina. Shame it's not in better condition. The coaching lamps are a very attractive pair. Today's auction has buyers online and in the room. Our teams are settling in. Let the battle of husband versus wife commence. The opening lot is the 19th-century treen spade that Thomas adored. -Ten I have on the net. -£10. Oh, you got £10. -Take twos if you wish. -£12, the gentleman. In the room at £12. Selling this time, then at 18. The spade secures Lynn and Thomas their first profit. I'm really pleased you're happy. And I'd buy it again. From a Thomas favourite to one of Margie's. The Noritake vase is next. £10. Ten bid. At £10. -£25 we have from the lady. At £25 on my left, I'm selling it. -I feel sorry for you. Not as sorry as Margie must be feeling. -That was one of our bankers. Next up, Lynn's German beechwood squeeze-box. Another profit for Lynn and Thomas. Well done. We can easily overtake that. Fighting talk, John. I like it. Look, your Victorian bonbon dish is up next. -Lady's bid at 50. 52. John's lots. But at least it wasn't another loss. Even he thought we'd make more than that. Moving on, it's the turn of the £2 tins. There must be a profit for Lynn here, surely. 20 bid. I have £20. -20. Two. Are you bidding? 25. Oh, you've got a tins collector. 30. 35 I have. We're in fives. -on the net. Against the room. 45 for that load of old tosh! -Oh, thank you so much, net. and didn't they just? What a profit! How do we make a dignified exit? -This is going to creep up. This is a quality piece. -It is a quality piece. -Anybody want it? £8 I have. Eight, we've got eight, with the auctioneer's wife. Thank you very much. I'm selling at £8. Oh, dear. This is not John and Margie's day. We've gone down the slippery. Oh, stop it! You don't mean a word of it. -You don't mean a word of it. -I do, I do, I do. I believe you, Thomas. Though thousands wouldn't. Time now for Lynn and Thomas's white metal Sri Lankan dish. Come on, 20, then. Let's start nice and low. 20 bid. In the front. -Come on, come on, take it. -28. I'll come back to you. 30. -£40? It's with the lady. That's the lady's bid. Anybody else now? -Just missed washing its face. A small loss for Lynn and Thomas. -We're clawing our way back, Margie. -We're clawing our way back. -We're on the ropes. We're on the ropes. And those blows are coming in. There you are, straight in. -Well done, you've doubled your money. £40 for the lady standing. -We're on your tail, mate. this time with their oil painting of the infant Hercules. Gone. The fat baby flopped. -Somebody got a bargain there because that was beautiful. -It was a good thing. their rare Georgian coach lamps. Good luck. They'll need it. £60. For a good pair of Georgian coach lamps. They are good, and they're not mine. They're not mine, and they're good. -£90 in the front row. There's no interest on the net. -No interest on the net! Any further bids now? £90 it is. -Oh, I feel for you. What a disappointment. But never mind. but that is a crushing blow. I thought there was a telephone bid coming up. -I think they were ordering their lunch. Time for the last lot of the day, then. There could be a profit here. Well, it's doing all right! And we end on a profit. sadly, they made a pretty dramatic loss of £199.14. Which means they end this trip with £200.86. they too failed to make a profit after auction costs. £10.74, which means the wife wins. Oh, yes. Lynn finishes with £389.26. I'm so sorry you lost. That will teach you to be rude about me. And being with you has been reward enough for me. How sweet. I feel even worse now. Sufficient reward just being with you. -Given that you've won, will you drive me home? really lovely and fascinating experience. -I mean, it's quite educational, isn't it? And, oh, I can get in top gear here. I think we've really missed out over the years. I'm going to go in more of them in future. Now I know slightly what I'm looking for. I'm pleased to hear it. Safe travels, road trippers. A celebrity couple road trip with award-winning journalists John Stapleton and Lynn Faulds Wood. Joining them on this jolly jaunt are Thomas Plant and Margie Cooper. With Â£400 in their pockets, the teams kick off in Wrightington, Lancashire, and head to Stockport for auction. Lynn and Thomas find themselves literally knee-deep in antiques while hunting for old biscuit tins, while Margie tries to convince John that some rare lamps will make a profit. John learns how an American revolutionised British public transport, and Lynn sees why snakes are milked in Liverpool.